Please select your Power Supply Unit connector type above. Swatch – Instead of staring at a number, you can set up a simple color square (we call them swatches) with programable color changes, to easily see when a parameter needs your attention. PCM – some receivers output a varying pulserate to indicate signal strength, which the Vector supports. Fast, easy control and menuing system: The Vector utilizes switch “gestures” and your control stick to let you rapidly scroll through menus and change parameters. All OSD parameters can be configured via the stick menus! Kitchen sink: Of course, all the other OSD features you’ve come to expect from Eagle Tree, such as RADAR, ladders, compass, full ‘F16’ AHI, flight simulator, manual waypoints, monitoring of up to four battery voltages, and a huge list of parameters available for display are there in the Vector. Utilizing our proven GuardianTM technology, the Vector’s built-in, full featured flight controller is equally at home with both fixed wing (traditional, elevon, v-tail, etc.) and multirotor (quadcopter, hexacopter) aircraft. And, since the controller is fully integrated with the OSD, everything can be adjusted via the onscreen menus, rather than needing to drag a laptop or other device to the field. The Vector’s built-in OSD provides features not found anywhere else. 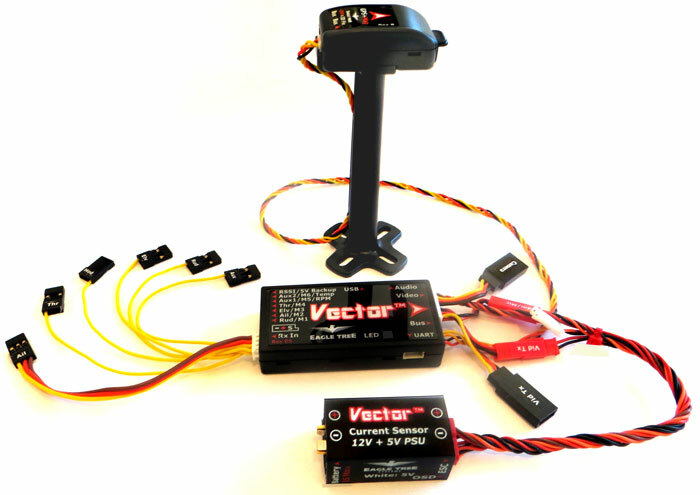 The Vector’s receiver input harness with labeled connectors makes it easy to connect to any receiver. SPPM and S-BUS: a single cable connects to your SPPM or FutabaTM compatible S.BUSTM outputs, for reduced wiring and more flexibility. The PC software lets you fully customize the meanings of up to 8 serial channels, making it easy to support a variety of OSD features. 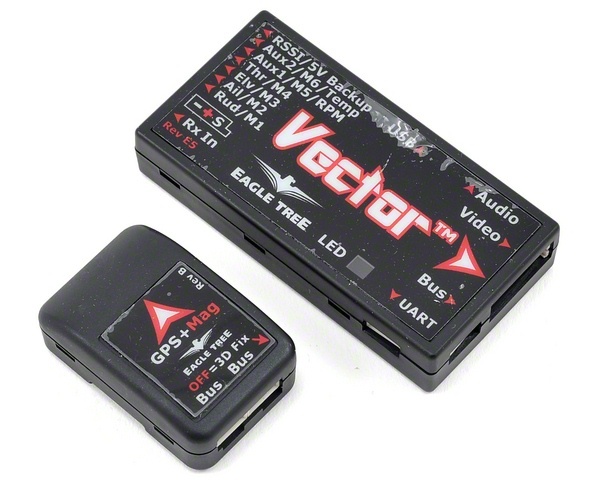 The Vector’’s flight modes are easily accessed via a 2 or 3 position “mode switch” on your radio. Further, a “submode” switch can be configured to allow more modes to be easily selected during flight. The meaning of each switch position is easily programmable via the Vector’s menus. Tired of using multiple batteries, LC filters, BECs, etc.? The Vector’s current sensor/PSU makes it super easy to power your equipment. The current sensor is available with DeansTM, XT60TM, or wire leads. The high efficiency, low noise PSU accepts up to 6S voltage input, and provides filtered 12V and 5V output at 1.5A max per channel. 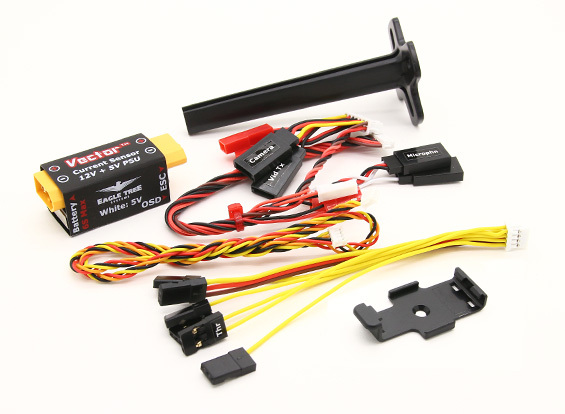 It’s perfect for powering most FPV gear, and also powers your receiver on multirotors with “opto” ESCs, eliminating the need for an external BEC. Note that the 12V regulator does NOT boost the voltage, like a SEPIC. However, the Vector’s 12V PSU has a unique Low Voltage Lossfeature that drops the regulator’s output by only about 0.5V if you are using a 3S pack operating below 12.5V. For example, if your 3S pack is at 11.5V, the regulator outputs about 11V. Other non-boost switching regulators typically drop the output voltage by 1.3V or more. In addition, SEPIC and other voltage boost regulators are generally much less efficient and generate much more UHF band noise, and in many cases you don’t need one. All known cameras and many transmitters will operate well across the 3S voltage range. Check your transmitter manual’s specs to determine this. If your transmitter does need a boost when operating at the lower end of 3S, a JST equipped boost regulator can easily be connected into the Vector’s AV harness without needing to cut wires. 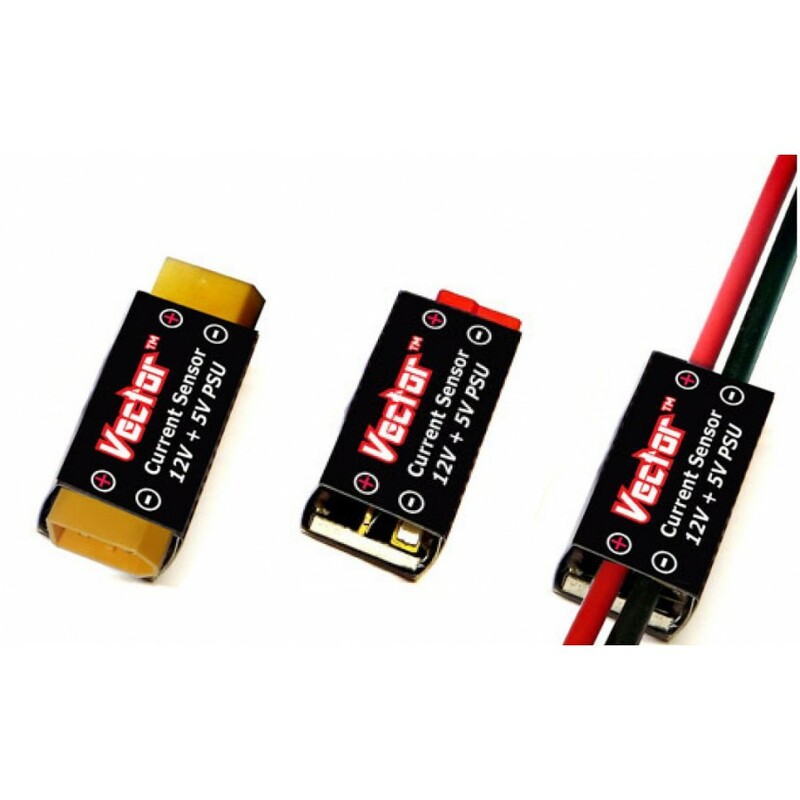 The Vector’s filtered PSU and innovative wiring harness (so innovative we’re not showing it for a little longer J) makes it easy to connect your 5V or 12V cameras and transmitters without keeping an electrician on standby. If your camera and transmitter+- has have servo style connectors already, you just need to plug them into the labeled plugs, select the appropriate voltages, and away you go. And, If you prefer to use 2 or even 3 flight batteries, additional filters, voltage boosters, etc., that’s trivial to do without needing to do any rewiring. The harness also makes it easy to move the Vector from model to model without removing all of the wiring as well. 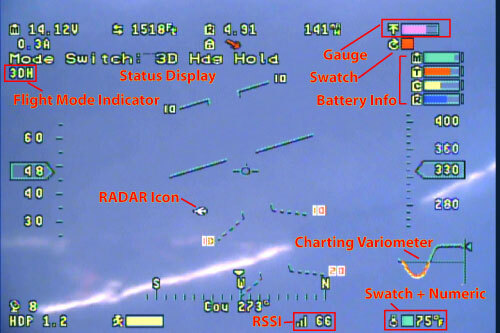 The Vector also embeds real-time telemetry in the video signal for use with the EagleEyesTM ground station. 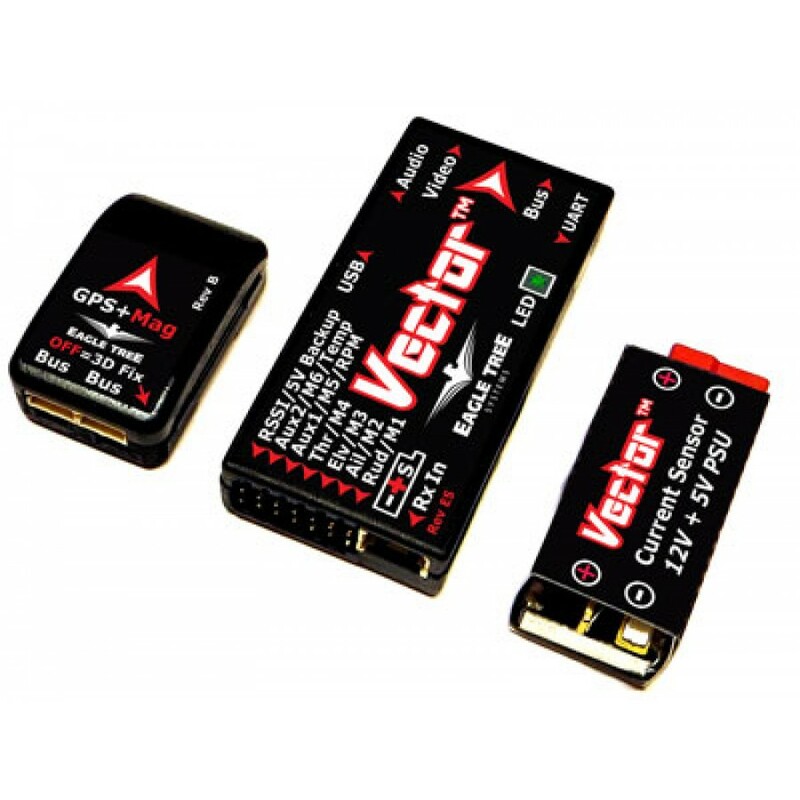 Further, the Vector’s UART port is compatible with open source telemetry transmitters and other hardware. We plan on supporting the UART interface with a variety of telemetry related features in the future. DeansTM, FutabaTM, SpektrumTM and all other brand and product names are trademarks of their respective holders. Want to configure your Vector via your PC or laptop? Our powerful PC software and the Vector’s USB interface make this easy. Drag and drop screen setup lets you see how the display will look as you configure it. Configuration files let you easily move your Vector from model to model without needing to reconfigure everything. Tabs for visualizing GPS flight data, manual waypoint management[This is going to raise some eyebrows. We should be clear that these are only *reference* waypoints and do not connect to any navigation functionality at this time], and many others make it quick and simple to fully utilize your Vector.